It has always amazed me that no 1/35 plastic kit has ever (in my knowledge) existed of this very famous British weapon. Resicast have had available for some years a set to fill this gap in the form of their 35.222 Vickers Machine Gun Kit. The .303 Vickers Medium Machine Gun provided the main support weapon for the British Infantry from WW1 through WW2 and beyond. It was also fitted to Universal Carriers, Armoured Cars, Trucks and installed in Bunkers. The gun was in service with the British Army from 1912 to 1968, and was also used by a host of countries around the world. Packed in the standard Resicast zip bag with 2 further zip bags inside, the set contains sufficient parts to make 2 complete guns, with a choice of optional barrels and various accessories. A coloured photograph is contained on the manufacturers’ kit sheet to aid painting. Cast in a light grey resin, detail on the parts is excellent. Instructions come in the form of the older style with an A4 sheet containing 3 reasonable pictures and identifying the build parts. Although in the older style, the instructions should provide enough information to build the guns successfully. You get 2 of each type of guns, the early Mk I (1914 version) and the later style Mk I (1944 version) where the canvas jacket and flash suppressor were added. These are nicely detailed showing the small change/modifications made to the basic gun over the period of WW2, and you also get the sighting arrangement for the later version in the form of the dial sight (Part N) which is accurately done. The 1914-1918 version should still be perfectly useable in early WW2 settings, as I doubt all guns were modified and upgraded in the 30’s (especially those overseas), although that is only my opinion. Earlier models were also issued to the Home Guard. The main update at that time was the Mk II muzzle attachment ‘bullet deflector’ and a funnel that got added to the condenser can, so best check your references if you need a very specific gun. The end of each barrel is pre-drilled, although you may wish to deepen these for sharper definition. The barrels represent the .303inch version of the Vickers Machine Gun and these are therefore designated Medium Machine Guns. The remaining detail on the guns is good and seems accurate from all the reference pictures I’ve looked at. 2 x firing handles, elevation wheels and tripods are provided for the for the 2 guns, as are 4 x 2 gal condenser cans used in conjunction with the water cooled barrel, so some lead wire may be needed to link the two together. All the parts are well defined and should be fairly easy to work with. Being a weapon, some of the parts are quite small, so take care not to lose any to the carpet monster and the use of an eye glass will help when building the kit. The tripod is made up of the socket, rear legs, front legs, arm crosshead and elevating wheel. All are well representative of the actual weapon parts. This can be modelled open with the gun attached or in the folded position. A variety of ammunition boxes are supplied and 2 ammunition belts are also provided, requiring careful handling. All the parts are well-detailed and only a sharp Xacto blade and small razor saw will be needed to remove them. 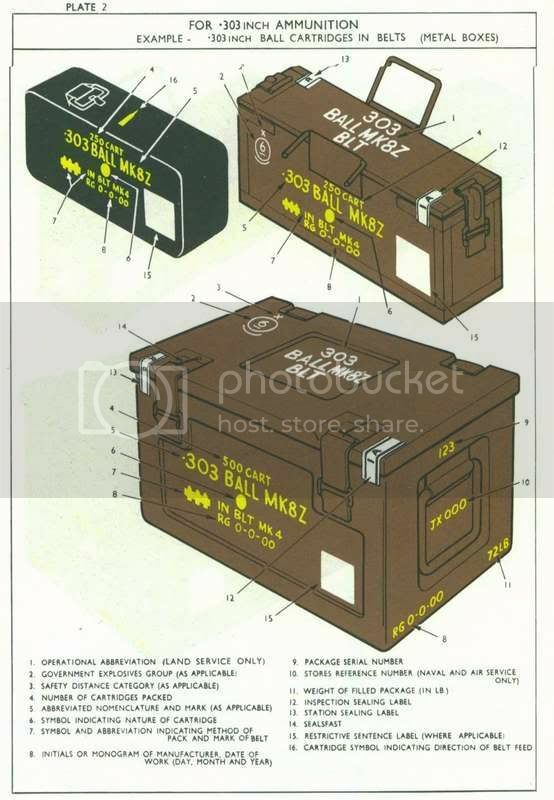 You get 3 Boxes of: "Belt Ammunition, Vickers .303 inch M.G. No 3 Mk 1" – one of which has an open top. Plus, you get 6 x "No 10 Mk I" boxes , 2 of which are open for fitting directly to the guns. The .303 inch ammo belts are quite well defined, but as already mentioned, these will require careful handling if you wish to avoid breakage. In addition to the above, you get 2 x open topped wooden packing cases complete with lids should you wish to display the guns in transit. As mentioned above, the tripods can be modelled open and fitted to the guns, or in the closed position to go with the cases. The boxes will require a little clean up to remove the pour stub and are detailed inside to hold the weapon when in the container. The only addition would be a couple of rope carrying handles attached to the box end. Normal precautions should be taken when working with resin, although the clean up on these parts should be minimal. This is currently the only kit of its type that I know of, depicting this famous and widely used weapon. A very useable kit, suitable for a wide variety of locations, from the trenches to vehicles and bunkers. In service with a host of countries, over a considerable period of time. A really useful set of machine guns, depicting a weapon used widely throughout WW2 and beyond. The option of the two different barrel styles is a real bonus allowing deployment of this weapon throughout the war period. The only down side is that being supplied with 4 MGs, you only get 2 sets of firing handles for them. So the option of 2 deployed MGs and 2 in the box, so to speak, is not there. The overall quality of the casting is excellent and you get enough parts to give a very good representation of this famous weapon. Additionally, these weapons were seen on trucks, armoured cars and in static defences like bunkers and trenches. If you happen to have the old Tamiya LRDG Chevrolet (item #35092) then one of these would make a valued addition. The option of depicting them in transit or just being unpacked and set up will also be a valuable addition to dio makers. Two additional sets are available from Resicast in the form of 35.532 Vickers Gun Team Marching and Set 35.581 which depicts a Vickers Machine Gun Crew in action. The kit number on the Resicast site is 35.222 and this is also shown on the instruction sheet. However, 35.2222 appears on the insert page of the kit and on the latest price listing. Highs: Good clean detailed casting, giving an accurate representation of the weapon, with additional options both in barrel style and method of display, allowing the maximum use of the gun. Lows: The lack of 2 additional firing handles limits the use of the 2 extra barrels and I would like to have seen the inclusion of a couple of Metal Boxes - Ammunition Small Arms H50 for added variety. The ammunition belts may be difficult to work with. Thanks Alan. That was a good read. Chas hit the nail on the head in his earlier post about the Johore strait because it was down to a handful of well trained vickers machine crews to stop/slow down the assault into Singapore. A devestating weapon in an indirect fire roll. I have this Resicast set It is quite a comprehensive machine gun set and well worth the money . Darren's post about brewing tea in the Tankers review thread reminded me of something in Robert Graves WW1 memoir which I thought I'd post here. Graves said the British machine gunners used to fire off a couple of belts in the morning to heat the water in the cooling jackets which they then used to make tea. True or false? What would the tea have tasted like?